Soo, I didn't love the Matched books a whole lot. BUT. ATLANTIA totally makes me think of Atlantis and, therefore, awesomeness, so consider me intrigued! Nice! I want to read this one too! I'm so excited about this one! I was jealous that everyone at ALA got the full book and BEA just had samplers, but oh well! 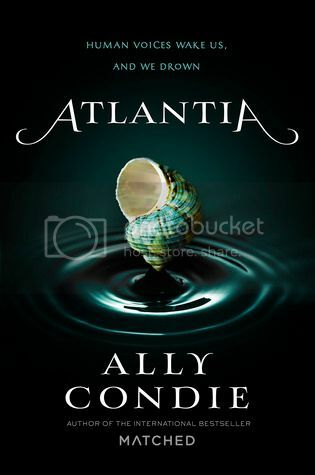 Haven't read Ally Condie before but this looks interesting! I didn't like Ally Condie's Matched series so much but this sounds pretty interesting and (fingers crossed) better than Matched... I'm hoping to read some reviews on this so I can really decide if I'll read it or not... Nice pick! This one sounds beautiful!! I cannot wait to read it. I'm definitely intrigued by this one! I'm very excited for this book! The summary sounds fabulous, and I quite enjoy Condie's writing style. I haven't read the last book in the Matched series yet, but I enjoyed the other two! Not sure Atlantia will be quite as much my style, but the cover is indeed gorgeous. I read the Matched Trilogy and enjoyed the first 2 books especially so I'm definitely wanting to check this one out as well! I love mermaids too so I hope this one delivers :D Fantastic pick ^^ I hope you can get your hands on it soon!